I know I am a little late with this, but I hope you like it anyway. It is my March Table and anything green or whimsical is on here. Let's not forget it is time for Spring Break also. I am really glad to see this! Its so pretty. I guess the leprechauns are probably busy back in Amiville. Wow I love this display, I never seen anything like this anymore where I live here in the UK! So it's nice to see on the Ville! Well done, you did a brilliant job! I love it, everything is so pretty! 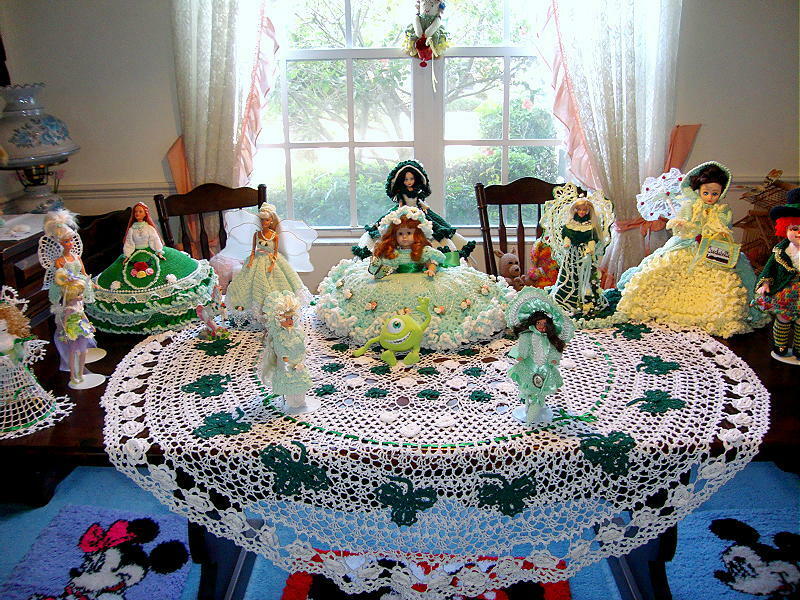 Beautiful, I love all your frilly dolls! And what a wonderful table topper. Your table is beautiful, Mary Jo. Thank you. I love doing the table every month. these are so pretty I love it you have done a great job with these. How did I missed that ? ?